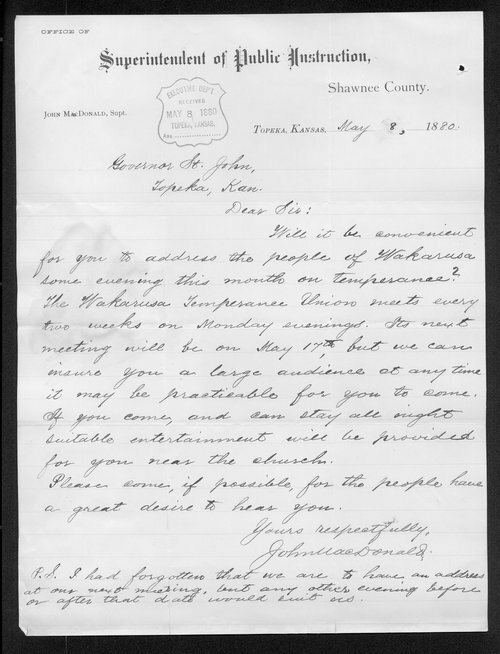 A letter from John MacDonald requesting Kansas Governor St. John deliver a temperance address to his community of Wakarusa, Kansas, whenever it would be convenient. He promises a large audience and "suitable entertainment", if the Governor can stay the night. MacDonald was the Superintendent of Public Instruction for Shawnee County and the letter is written on his official letterhead.